When we traveled to Italy last March with Stacey and François, owners of Matchvino, one of the highlights was meeting winemakers Michele Conoscente and Chiara Penati (pictured above) from Oltretorrente, translated to ‘outside the stream of life’. This husband and wife team left their corporate jobs, and moved their family to the hills of Piedmont to make wine. With the intention of creating artisanal wines that reflected both history and place, their project began with small organic plots of indigenous varietals. Growing exclusively Cortese, Barbera, Dolcetto, and Timorasso, Michele and Chiara work painstakingly to produce wines that express the unique terroir of the area, while incorporating their own modern approach to winemaking. Come taste them with Matchvino tomorrow! Timorasso is a local grape – a golden rod of a grape – and a special one worth seeking out. 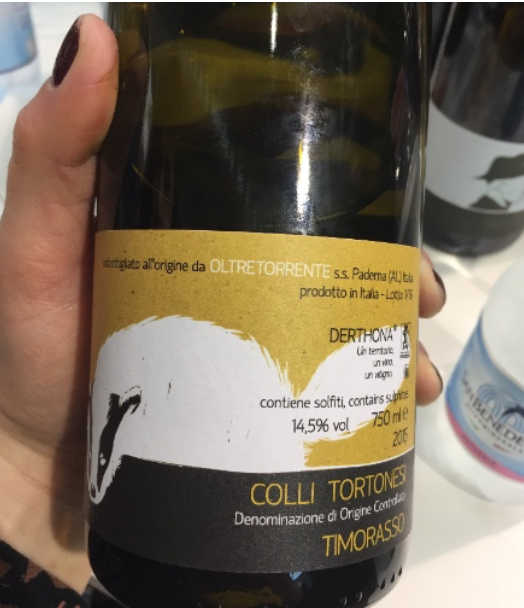 Oltretorrente’s Timorasso is full-bodied and structured with notes of orange marmalade, green tea, white flower, honeysuckle, and a bit of nuttiness. It pleases the Chardonnay drinker, Sauvignon Blanc loyalist, and even the most fastidious Riesling drinker. Chalky and calcareous soils help give Oltretorrente’s Barbera that textbook Piedmont radiance. About two-thirds of the wine sees neutral oak, while the remainder sees new oak, imparting a slight vanilla and roundness in the juicy finish of this elegant red. A rosé that is all texture and finesse. Made from a blend of Groppello, Marzemino, Sangiovese, and Barbera, this Chiaretto spent only a few hours on its grape must to preserve its freshness and balance. Classic aromas of rose petal, strawberry, and raspberry lead to a robust mineral core. Balanced, refreshing, and effortlessly delicate. A Pinot Noir from Bolzano! Pravis believes that the past should be respected in order to flourish in the future, and they use the least amount of technology possible to make their wine. A cool-climate Pinot with robust berry fruit and bright acidity – a fitting greeting to the changing fall weather. A bold red blend made by Oliviero Toscani and his son Rocco. This unusual blend of Syrah, Cabernet Franc and Teroldego, undergoes malolactic fermentation in oak creating the signature Toscani silky mouthfeel of round tannins. Deep crimson with violet hues, the aromas are fresh with notes of clove spice, and the palate is fruit forward and velvety.